Want to know when our next show will be? Enter your email address here to be notified about our upcoming shows and other events. Want to sing with the Thunderbirds? 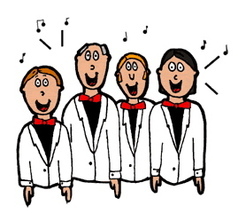 At Christmas the Thunderbird Chorus sings at Children's Hospital, Granville Island, shopping malls and other public venues. Do you love to sing Christmas songs to light up the holiday season? Learn how you can sing with us this season.